Goose Lake Prairie – Let's Paint Nature! I’m sorry I haven’t been very bloggie lately, but I ‘m having some transportation issues that are weighing me down. Nevertheless, I was able to take a wonderful trip with my mom to Goose Lake Prairie, which is about 1 hour southwest of Chicago. I love prairies. You may have noticed that I like to paint prairies. You can see a few on the landscape page and one that I recently won a ribbon for on the schedule page titled, Indian Summer. What’s so great about a vast plot of not a whole lot? HA, HA, HA that rhymes! Well, I always fall in love with the different colors throughout a prairie that are not green. For example, on the day I walked through Goose Lake Prairie, there were yellow black eyed susans, yellow sunflowers, purple wild bergamot, and purple prairie blazing star. 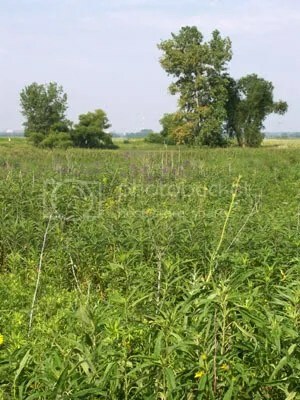 A prairie may look boring and green but if you look very carefully, you’ll be pleasently surprised with hidden color. Here we found a marsh along the trail. Do you see those white specs in the background? Those are 4 white herons! What you can’t see are the killdeer that walked along the shore and the swallows that skimmed the surface of the water at very high speeds to take a drink. How much fun! 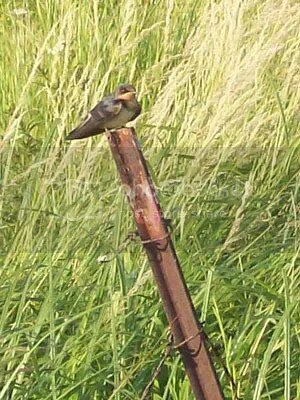 Here this barn swallow kindly posed for a picture. He was very close, but didn’t move…very brave. They’re so quick, I was surprised this one stayed put. More pictures to come of Goose Lake Prairie. I LOVE the little barn swallow! That’s a great shot! I agree w/your comment about prairies & I would extend that to say that anyone simply examining their own yards/neighborhoods would probably be surprised at the variety & beauty that they’d find! I like prairies too – they seem endless – like the world is opened up to you. Look forward to more of your pics! I love prairies, too–so very serene. This is gorgeous, Chris. 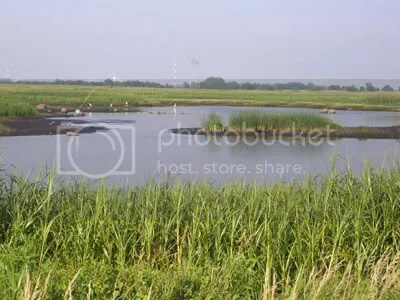 Marshes are so interesting. Great photo of the Barn Swallow – the light is perfect, and I like the grasses in the background. I have been to the Prairies, too, (Saskatchewan) where you can see as far as the horizon. Lana: Thanks! Yes you’re right, when in you’re own yard if you’re patient and quiet you can hear and see so much more! Shelley: Thank you 🙂 Prairies are peaceful to me! Nina: Yes I agree! Thanks! April: WOW! That sounds wonderful, I would love to be there. I think I like the grasses so much because of it’s movement and the cute little birdies! Drowsey: Isn’t he the best!!! We love him! 🙂 Thanks.